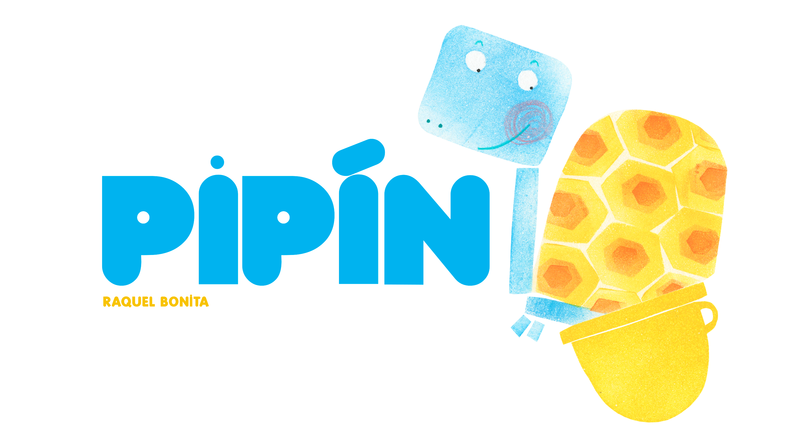 Pipín es un libro para pre lectores que basa la narración en el juego con las pestañas. La historia trata de una pequeña tortuga que harta del pañal se empeña en dejar de usarlo pero debe aprender a identificar cuando tiene ganas de ir al baño. Al principio, aunque tiene ganas de ir al baño, espera y lo relega para jugar, pintar, etc. Y de esta forma nunca llega a tiempo al baño. Aunque en cada etapa deja de hacer una de las cosas que hacía antes, sigue sin llegar al baño, aunque cada vez está más cerca. Al final se da cuenta de que cuando se empieza a hacer pis, tiene que ir directo al baño para llegar a tiempo. Quería construir un personaje independiente que es capaz de resolver el problema por sí mismo, mostrando que equivocarse no es malo. Al contrario, los errores son parte del aprendizaje. Pipin is a pre readers book who’s narration is based on the game with the flaps. The story is about a little turtle. He gets tired of wear nappies so he decides to stop wearing them. But he has to learn how to identify when he has to go to the potty. At the beginning, although he has to go to the toilet, he waits, plays, paints, etc. so at the end he never arrives on time to the toilet. In each step he leaves one of the activities so he is geting closer more and more to arrive on time. But only when he goes straight to the toilet (without anyother distraction) is when finally he arrives on time. I wanted to build an independent character who solve the problems by himself (2-3 years-old children begins to be aware about the things that they can do by theirselves). I like to show that to make mistakes is not bad. On the contrary, mistakes are part of our learning.